A Cork mother celebrated the safe delivery of her 'storm baby' - and joked that her new daughter was never going to be called Ophelia. 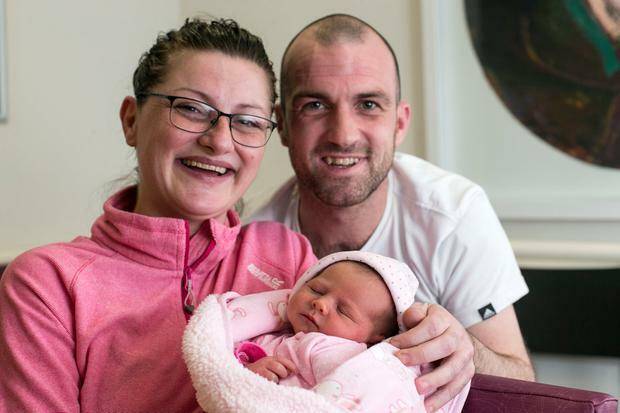 Sonya Burke admitted the birth of little Maria last Monday was "quite dramatic" given that she went into labour at 8.15am just as Storm Ophelia struck Cork. Sonya went into labour at her Crosshaven home - and was delivering her little girl as heroic paramedics rushed her to Cork University Maternity Hospital (CUMH) while coping with winds starting to gust at 130kmh, as well as dangerous falling trees. The mother of two, who also has a little boy called Jamie, has not yet been able to go home from CUMH because the family home still has no power or water due to the storm. But Sonya, husband Colm, and Jamie are now celebrating the safe arrival of baby Maria, who was born three weeks early, and tipped the scales at 6lbs 15oz. "The trip to the hospital was a little bit shaky - we did have to briefly stop on the way," Sonya said. She thanked the ambulance crew via Cork's 96FM and said her entire family was grateful for them braving the storm. "They were absolutely fantastic," she said.